For many Indian children brought up on Ramayana stories, Hanuman was their first superhero. Who else could traverse miles with a single leap or shrink to the size of a pea? The superhuman monkey god is a symbol of power, restraint, loyalty and celibacy and is worshipped for these reasons. With his help, Lord Rama, the seventh incarnation of Lord Vishnu, could vanquish demon king Ravana and save his wife Sita. His birth is of utmost importance to the Hindus who celebrate it every year as Hanuman Jayanti. This year, Hanuman Jayanti will be celebrated on April 19. The Bajrang Bali, as he is popularly known, was born in the month of Chaitra after 12-long-years of penance by his mother Anjana. 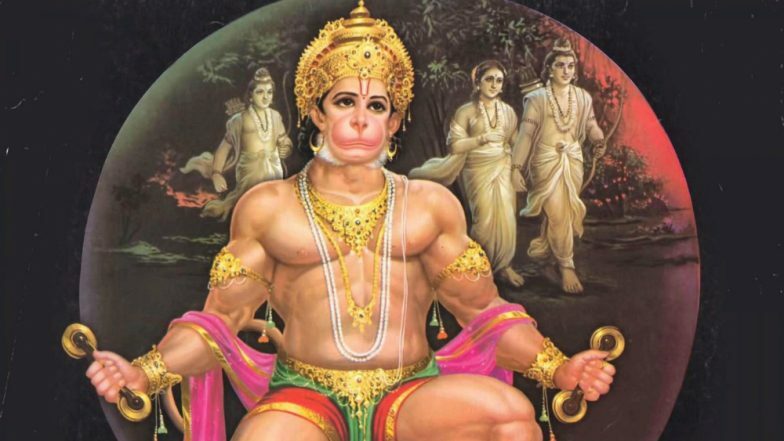 On Hanuman Jayanti 2019, let’s learn 7 most interesting facts about our beloved monkey god. Although his son was the Vanara God Kesari, Hanuman is also known as Pawan Putra, which means the son of wind or Vayu Dev. His mother was Anjani, an apsara who was cursed to live on earth. It is said that when King Dasharatha performed the Putra Kamesti Yagna, part of the pasaya that was given to him by Yagna Deva was snatched by a bird who dropped it close to the mountain where Anjana was performing penance for a son. Vayu Deva carried the payasa and deposited it in Anjana’s hand who later consumed it. Thus was born Hanuman. Hanuman Chalisa During Brain Surgery! Man Recites Religious Hymn While Being Operated for Tumour. The Pandava brother famed for his superhuman strength like Hanuman was Bhima. Coincidentally, he is also the monkey god’s brother by virtue of their paternity. According to the Puranas, each of Kunti’s sons was fathered by one of the devas and Bhima’s father was Vayu. In Hanuman Chalisa, Tulisidas explains the monkey god’s leap into the sky through the lines "yuga-sahasra-yojana para bhanu leelyo tahi madhura phala janu.” He jumps into the sky, reaching for the sun, thinking it is a bright red fruit. 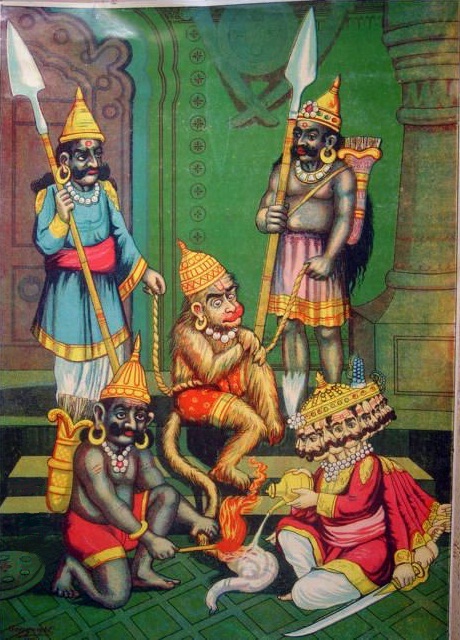 Hanuman was then struck down by Lord Indra by his weapon Vajra or thunderbolt. Is the Distance to Sun From Earth Found in Hanuman Chalisa's Chaupai; Read Lyrics. Although he is eternally devoted to Lord Rama, Hanuman once defeated him in a battle. According to an account, Yayati approached Hanuman to seek refuge from Lord Rama. Sage Vishwamitra had instructed Rama to kill Yayati. Hanuman gave him his word that nothing wrong will happen to him. But chose to defeat Rama in a unique way. By chanting Rama’s name, Hanuman managed to render each of the Lord’s bow ineffective. Seeing Hanuman’s devotion, Rama couldn’t carry out the task and Vishwamitra took back his order. Everyone knows of Hanuman’s love for food, which made him leap for the sun when he was little. But the mighty god had a ravenous appetite even in adulthood. 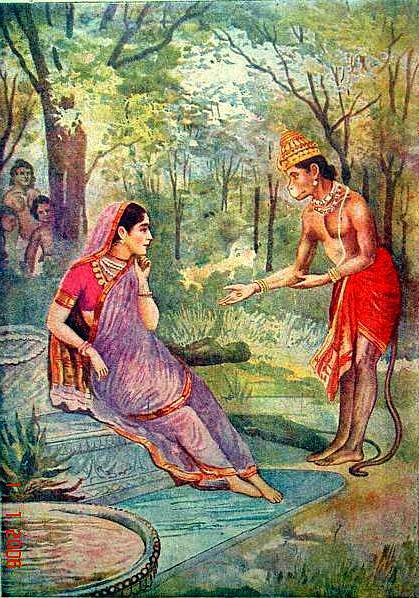 Once Sita cooked many delicacies to quell Hanuman’s hunger, but it showed no signs of waning. Lord Rama then offered him a single tulsi leaf, which was enough to satiate him. Hanuman is a Naisthika Bramhachari (eternally celibate), but he did father a son. His child is Makardhwaja who was born accidentally. When Hanuman took a dip in the sea to douse the fire in his tail after burning Lanka, a drop of his sweat fell into Makara, a sea creature’s mouth. Makaradhwaja was thus born. Hanuman is a chiranjivi or an immortal because he has the boon of immortality. So he still lives according to some accounts. As long as Rama’s name is taken by the people in the world, Hanuman will continue to live till the end of time. Hanuman’s stories span across the three yugas: Tretha Yuga, Dwapara Yuga and Kali Yuga, which indicate that he has an extraordinarily long life.